When you think of working in the property market, you may start to conjure up images of working nine to five and then spending your nights socialising with other young budding property professionals. While this may be true in some cases, new recruits entering the world of property should be ready to hit the ground running and wave goodbye to their social life, as they will be expected to put in long working hours until they can get some experience under their belt. 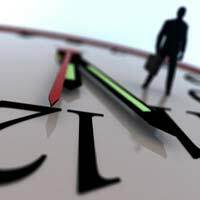 Not all sectors and professions of the property market will expect you to work yourself into the ground, but the a lot of the larger firms will not stick to working the usual nine to five working hours. On top of any deadlines you may need to stay behind to work on, you will normally also be expected to put in general extra hours. If you see a job that advertises working 35 hours a week, the chances are that you will be working nearer to 45. It’s not all bad news though, property firms will often work by the mentality of working hard and playing hard, so you may be in the office until 9pm, but then you might be out meeting clients, sipping on cocktail. There will be other occasions when you will need to go travelling with work, which will form part of your working hours. You will be expected to socialise and entertain nay clients or business partners that you meet along the way, so this could mean a lot of after hours socialising. Don’t despair though, a property firm may work you hard, but it will also reward you well. Some companies will operate a very flexible time in lieu policy, so if you have to work extra hours or pop into the office at the weekend, then they may let you have time off during the week, or extend a holiday. It is always worth asking when you go for a job interview what they typical working hours are. A lot of jobs in property will not even advertise the working hours because they will just expect you to work until the job is done.Firms will often reward staff with large bonuses and company cars, so the hard work will in the end all pay off. The residential property market works in a slightly different way to the commercial one. Estate agents and property mangers will normally have different working hours and work a lot of evenings and weekends, to keep up-to-date with properties. A lot of potential home buyers will work during the day, so house viewings will often cut into the night time, meaning if you are working in residential property, you may have to spend your nights zooming people around in your car, dashing from house to house. Other sectors of the property market such as the commercial market will normally encourage staff to work late nights instead of the weekends. Although the people who work in property will often find themselves chained to their desks, they will often not hear them complaining about the working hours. The long hours become second nature to many in the industry and if you are passionate about the job, it is not a problem, which is why you need to make sure you are passionate about property, before you take the leap.